Each year, 4-H members keep a record of each of their project areas by completing a Kansas Award Portfolio (KAP). The KAP's are narrowed down to the best in their project area first at the club level, then the county level, then the area level, and finally at the state level. In the end, only one 4-H member in the entire state of Kansas comes out as the winning KAP in a project area. State KAP judging results for the 2016-2017 4-H year were finalized last week. We are very honored to announce that for the first time in several years we have not ONE, not TWO, but THREE winning Kansas 4-H KAP's coming from Coffey County this year. 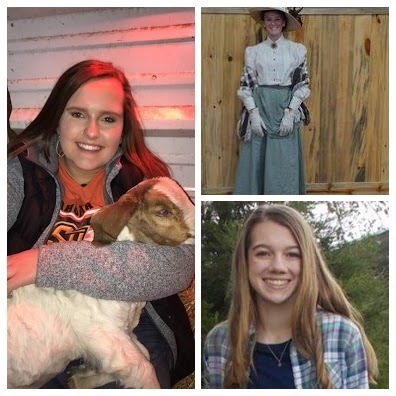 Congratulations to SARAH SERGEANT, Blue Ribbon 4-H Club, Communications; AUDREY DURST, Blue Ribbon 4-H Club, Shooting Sports; and KAYLYNN VOGTS, Tip Top 4-H Club, Visual Arts for being selected as state KAP winners this year! Sarah, Audrey, and Kaylynn will be honored at the Emerald Circle Banquet during Discovery Days on May 31st. They will also be invited to attend National 4-H Congress in Atlanta, Georgia this fall. This is an incredible honor! Way to represent yourself, your club, your community, and Coffey County 4-H!